Can You Really Make Money With The Lucktastic App? Most "make money apps" simply don't make much income. That's why this is the only company I recommend for anyone serious about making money online. If you have EVER read about or researched apps that could possibly make you some side-cash, then you have doubtlessly heard about this one. This app is one of the most popular cash-making apps in existence today. But can you really make money with the Lucktastic app? I was more than excited to give this one a try. It’s been on my radar for quite a while now, and I finally decided to download it and give it the trial-run it deseves (cracks knuckles… sits down at desk… strikes dramatic pose). First, let’s take a look at the basic stats. The app has over 10 million downloads, and has been reviewed by over 230,000 people. To put it quite bluntly… the user base is HUGE. It also has a 4.2 star rating on Google Play, which is certainly above average for apps like this. Upon opening the app, I was surprised to find that the display defaulted to a landscape view. This was unusual, but also pretty cool. It made everything easier to see. 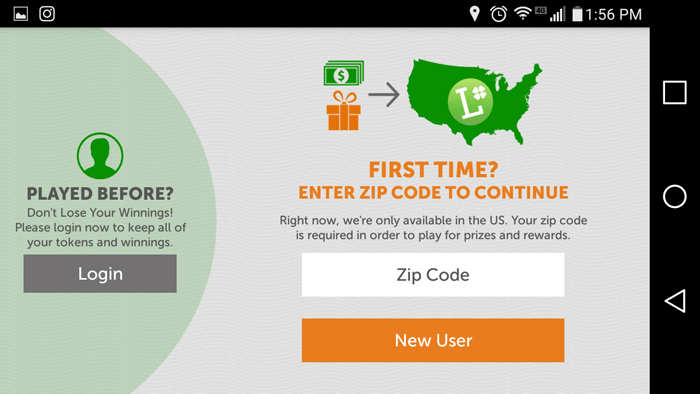 This was the first screen that I saw when I opened up Lucktastic for the first time, and since I have never had an account with them before, I went ahead and entered my zip code to begin the process. As of right now, the app is only available in the US. That is good for US residents, bad for everyone else… but I had no complaint (I live in the middle of the United States… in a tiny town… so Lucktastic seemed like a perfect fit for me thus-far). After a loading screen that featured a spinning clover graphic, I was taken to this page. Right away, I will admit that my attention was immediately grabbed by the banner along the top, which told me that I had unlocked a $5,000 card! Part of me hoped that this meant $5,000 in cash… but I had a feeling it was more of a lottery-ticket card with the potential to win $5,000. I was right—it was like a scratcher. Now it was time to play and, hopefully, earn some sweet cash! I scratched the scratcher until all of the squares were all clean. I also scratched off the bonus part. I was awarded 100 tokens in the bonus section, but nothing else. Once I had scratched everything off, a ‘claim’ button popped up, which I clicked. This took me to the next screen. I clicked continue to get to the next part of the app. This brought me to yet another screen. I clicked ‘play now,’ because I was really interested in winning something awesome… and this brought me to what seemed to be the ‘main hub’ of the app. Here, I could pretty much see everything that the app could do. The little clover in the upper left hand corner was a drop down menu. I saw that I could attempt to win $50 with a scratcher in the ‘Today Only’ section, so that’s what I tried first. I clicked on it, and was taken to another screen. But before I could do anything, I had to watch a video ad. After that, I had another regular ad pop up that I had to exit out of. And thus… we see how Lucktastic makes their money! But the ads weren’t super oppressive. They were over in less than 30 seconds, so that’s not such a bad thing. This scratcher was pretty much exactly like the last one—except that instead of earning no cash and 100 tokens, I earned no cash and 4 tokens! But now, I had the scratcher-fever. The app was pretty fun, to be fair… so I decided to do all of the scratchers that I could. You don't have to watch the whole video because it's a little long and boring, but skip around a bit and you'll see the kinds of games available. Before being able to do anything else, I was prompted to register with Lucktastic… which didn’t surprise me. So I did, using my Facebook login information. It was pretty easy, as it usually is. Lucktastic, however, wanted to be able to post to Facebook for me! This alarmed me just a little bit… but I set the privacy settings to ‘only me,’ just in case… and then continued the registration process. About 15 hours and 20 scratchers later (it didn’t take me 15 hours to play 20 scratchers. I waited long enough to get the daily bonus), I ended up here. This is what the inside of my ‘Wallet’ looked like. I had earned a total of $1 in prize money, and 403 Tokens. Now, I know that $1 is worth $1… but I wasn’t sure what the Tokens would give me—and that is what I wanted to figure out next. You pretty much get Tokens every time you play. Often, they are the only thing you actually get, and are located in the Bonus Box. But you also get extra Tokens for Daily Rewards, and there are some scratcher games that reward you with Tokens specifically, instead of with cash. This app is pretty cool because even if you don’t win cash, you can still make Tokens… and you do, on every scratcher. So you will always win something. But I wanted to figure out exactly how much they were worth. How Much Are Tokens Worth In Lucktastic? From the ‘My Wallet’ section of the app, I clicked on the ‘Redeem’ button, and was taken to this page. 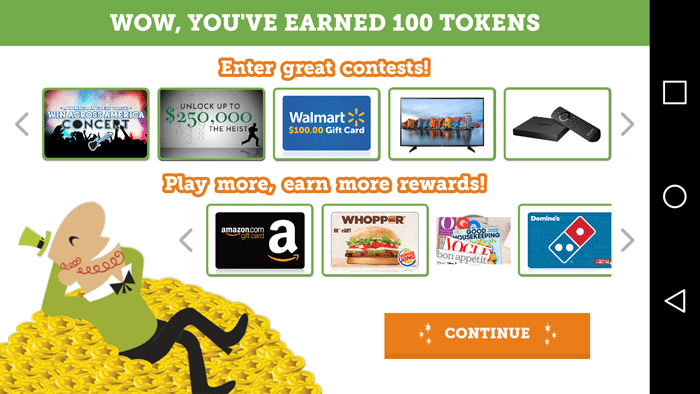 There were quite a few gift card options that you could get in exchange for your Tokens, including a $50 Amazon Gift Card that you could earn in exchange for 130,000 Tokens. In one day, I had pretty much earned 403 tokens… and to be honest, the scratchers that I played to earn those didn’t even take up a huge portion of my day. I just played them in my down-time… but they ended up adding up in terms of Tokens. 130,000 Tokens, divided by 400 Tokens per day, give or take, brings us to 325 days. At this rate, it would take me that long to earn a $50 Amazon Gift card. 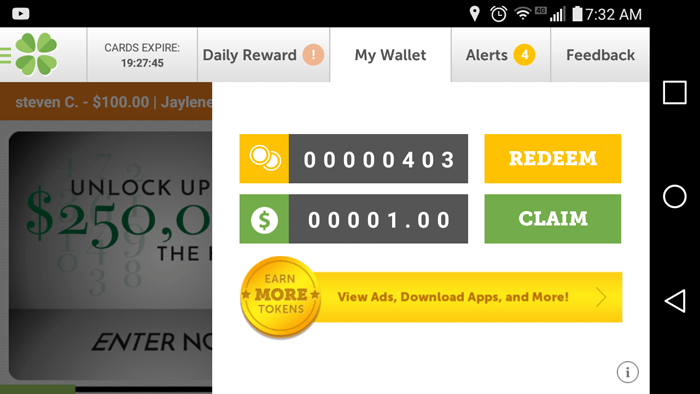 If I could increase my daily Token income to 500 (which would take a bit more or even less time on some days, depending on how well the Daily Deals are in the long run), then I could earn the gift card in 260 days. 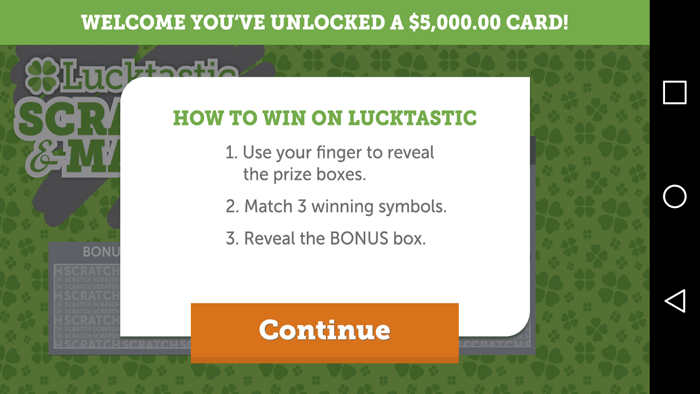 But at the same time, Lucktastic is giving me the opportunity to earn actual cash with the scratchers—so it is important to keep in mind that you are not just getting Tokens when you use the app. I mean, I won $1 on my first day. At that rate, in theory, I would earn $260 by the time I had used the app 260 days (Though I have no way of knowing if that is actually an accurate prediction. It probably isn’t.). What Did I Personally Think Of Lucktastic? Personally, I can definitely see the appeal of this app. It has an almost gambling-esque feel to it, but therein lies the magic. 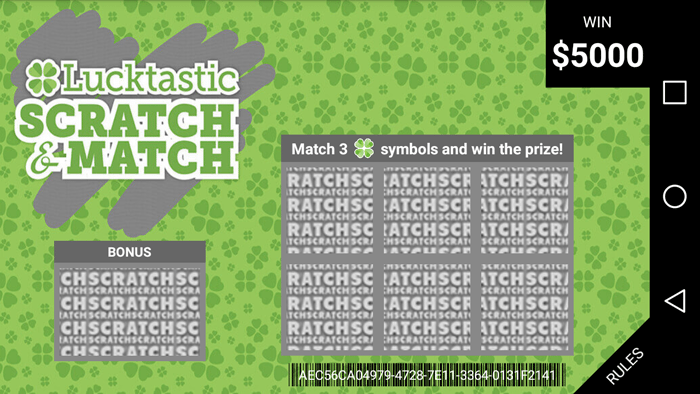 You download the app for the scratchers, really, which are pretty fun—but are rewarded with Tokens even if you don’t win, so Lucktastic has made it possible to rationalize playing, even if you never really earn cash rewards! The app is full of good points. The only bad points that I see are probably that you don’t win at the scratchers very often, and that you will need a lot of Tokens to actually score a gift card. But—with that being said, the app still makes itself worthwhile if you have a lot of extra time and are extremely bored. If you were to win big at even one of the smaller scratchers, you would definitely turn the tide and make the app extremely profitable. Plus, the advertisements that seem to pay for it really aren’t even that noticeable. They do occur, but they didn’t really bother me. There seem to be far fewer on this app than I have seen on other apps, which is good. Did Lucktastic deliver on what is promised to do? Yes. Did I enjoy spending my time this way? No. Personally, I have a hard time spending 1 year to earn a $50 gift card. I'd rather spend my time learning something interesting, or building my online business bigger to make more money in a more consistent way. Should you download it and use it on your phone? Honestly, when you calculate the time spent trying to make money with apps, it rarely works out to be more than a few dollars per hour. Most of the time, you'll only make a few dollars per month. Personally, I think my time is worth more than that! That's why in 2010 I learned how to make my own website and earn money through online advertising. After a few months of working on my website I was earning consistent income and within two years I was generating over $10,000 per month. The same training I used to start earning online, passive income is currently open to new members. The beginner course is FREE, and if you join through my link, I will be available for personal support as you build your own business. I like that you can make money from playing games but this is not something i would do to try to make money online. If I was someone who played games often then this would be a better alternative than to play for nothing at all. By just reading the first few lines, the only thing ringing in my ear is, “this is definitely gambling,” a game of chance and luck, of which I’m not really thrilled about. I always thought of gambling to be a dangerous game which I will never advocate. It’s also like playing the lottery where you end up losing rather than winning. So gambling is a big NO, NO to me! Thanks for an honest and detailed review. How is it gambling if you’re not putting any money in? Really. Your review of Lucktastic was very through and explained everything I needed to know to decide on whether I should bother installing this app. Thanks for this well written article. I do have a couple of questions. You mention you learned how to make websites and that is how you are earning money. Could you give me some more insight as to what the free beginning training entails? Also, what happens after the initial training? Building websites sounds intriguing, and free is a good price, but I do not have much money to invest. Thanks for show the downside of the Lucktastic app. It honestly sounds like it would be a good app if you’re the type to play apps on your phone anyway. Why not try Lucktastic and maybe make a few bucks, if you often waste time by playing things like Candy Crush anyway? I can see the attraction if you find yourself in situations a lot where you need to pass the time (ie waiting in the doctor’s office). That being said, it does sound like a pretty poor app if your goal is to actually make money. Almost a year for a $50 gift card is way too long for me! This is a very detailed post and I appreciate the honesty. I love reviews that are, not only honest, but based on real and true testimony as well. You actually tried the product prior to reviewing it. Great Job. I agree that these app type of programs can be time waisters, not real money makers. Great post. It’s nice to see a review for an app that is honest, to the point and very thorough. your photos and the video shows that you spent a lot of time in learning the pros and cons of this app, and your final opinion is certainly refreshingly honest. The concept for the app does seem like a good one, but if it’s a time waster then yes, something more productive is in order. Your additional recommendation looks much more appealing! Great review on Lucktastic. I really enjoyed you going through all the steps and scratching away to find out how it works. Unfortunately or should I say fortunately I’m not able to download and use the app so no stress. I’m always looking for new business opportunities and income streams so I enjoyed your review anyway. Taking almost a year to work your way up to a $50 gift card is also not my cup of tea/coffee (hahaha). That would be time better spent elsewhere like your #1 recommendation for training. Thanks for taking time out to make our lives easier. Yeah, I get addicted to smartphone apps sometimes too. Mostly games though. I think I got frustrated enough with lucktastic that it ended up not being too addictive for me. Maybe if they paid more regularly I’d stick around longer! Hi Nathaniell, thanks for the very clear explanation of Luckastic. Very well presented and explained with the screenshots and supporting video. It does seem to be a very good way at passing time and may earning some credits and a tiny bit of money. But, I think I can find better ways of making money with my time than this. 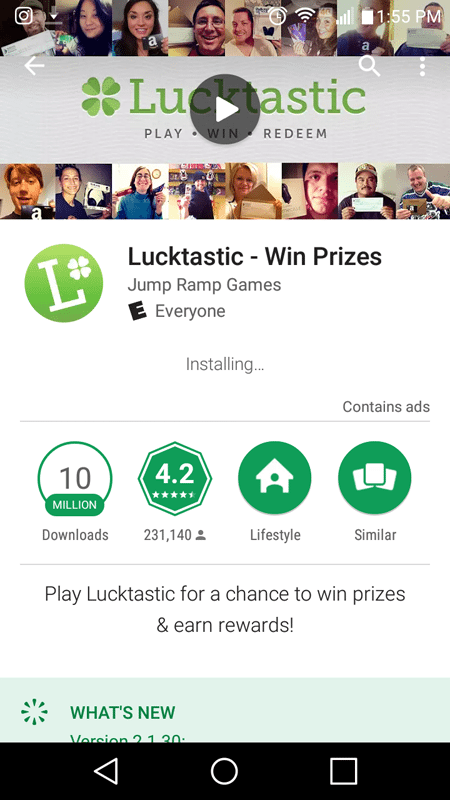 Luckastic seems to be very good at creating the buzz to keep people going and getting them addicted. There is a clear goal to make credits to buy something that I maybe don’t really want and give one a feeling that it was free. But to me time is money and therefore it is not really free. So Luckastic is not for me, but thanks for an excellent mind opening review. Great article about a fantastic way to waste time, lol. Seriously though, it is well written, full of information. I like the fact that you have tried it for yourself, saving everyone a lot of wasted time trying it out. For people who are addicted to playing apps anyway, this might seem to offer a little reward, better than losing money by gambling. However, we shouldn’t be encouraging this kind of addiction. Better to spend time online building a business. This is a very good review about Lucktastic you have a lot of good in depth information on it. I have seen the game, but have not played it yet. Guess having a chance at winning something is better than nothing. After reading your article I think I can find something better to spend my time on. Thank you for writing the great article. Thanks for stopping by Connie, and I’m glad we’re on the same with with regards to Lucktastic. Have you ever tried any apps that you do like? I’ve been reviewing a bunch and haven’t found many that are very good. A popular one called Swagbucks was one that disappointed me, although I did like their desktop games. I’m glad to see that you actually tried this app yourself before reviewing it, make me trust what your saying a whole lot more. As far as the app itself goes, it does seem like its i large a waste of time. However, is seems to be something many of us can just do while on our commute from and to work or whenever we have any free time. It beats playing games like angry birds, where you have zero chance of making any money at all lol. Thanks for the honest review on this interesting app ! Ha! Yeah, it certainly does beat playing angry birds. But I almost think an audiobook on how to start a business or side-hustle would be more interesting than playing the games in Lucktastic. If we’re talking productivity VS time? You could probably learn a lot more and even improve your current job situation just by reading and listening to self-improvement books rather than using the Lucktastic app. It was almost comical to read of your “ventures” in playing this App for the first time. With so many people in the U.S. addicted to gambling, (especially seen on the incredible number of online casino sites that seem to pop up daily) it is clear to me why this Lucktastic app has so many enthusiastic users. Still, in the end reading what you had to go through as the site seemed to lead you on a string for hours, it also is a tremendous waste of time. I could tell right away when immediately after joining you were told that you had just unlocked a $5,000 card – which turned out to be not exactly as it seemed. For a person hooked on this type of entertainment, to have the ability in their day to while away hour after hour using this app in the hopes of winning money, couldn’t they do something more productive? Silly question as, akin to playing video games both on gaming consoles and online it is a multi-billion dollar industry, people ARE attracted to these types of opportunities. Otherwise this app never would have been created. For those individuals who are looking for legit money-making opportunities, this app definitely does not present one in my opinion. It’s always frustrating to deal with false advertising like opening a “$5,000 card”. Of course, it never turns out that way. I was pretty much aware of that before I even got started, but even though I’m skeptical of these things, I have to check them out! 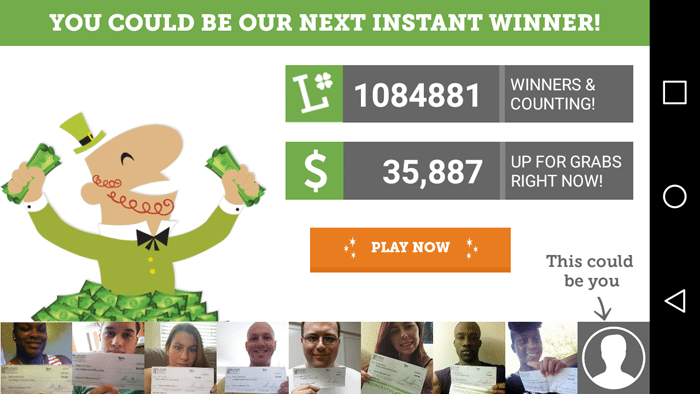 Making money with Lucktastic might be possible for some people, but I”m not a betting man. I “play the odds” by spending my time working on a business. Rather than try to make a hail Mary on a smartphone app, I’ll put the time in to build a website. Wow! I’ve never heard about this app before, but you’re right – the gambling side of it does make it look appealing. I don’t like that you make just a few dollars per hour and it does seem like a waste of time. Thanks for this in depth review! I love your visuals and explanation. It’s nice to know you actually tried it before writing a review – I appreciate your experience. Thanks for pointing other, more reasonable ways to earn money online. It’s always important to me to try apps before I recommend them or not. That way I can say for sure if they are worth your time! Very intriguing and helpful review, I have not gotten it yet so I was reluctant to read the article. Seems to me that is is a user friendly game, and the interface looks decent and fun, I might try this. Thank you very much for the review and recommendation, and awesome website overall! Not sure I’d actually recommend “trying” it. I think reading about it is enough. So far, most people haven’t really found it worth their time! Not sure I’d actually recommend “trying” it. I think most people found it wasn’t really worth their time. I think reading about Lucktastic is about all the experience you need to figure out what its about. I mean, it depends on your goal for making money. If you want to mess around and MAYBE make a few bucks, then it could be for you. But if you are serious about making a financial impact in your life then I would recommend starting an online business instead. 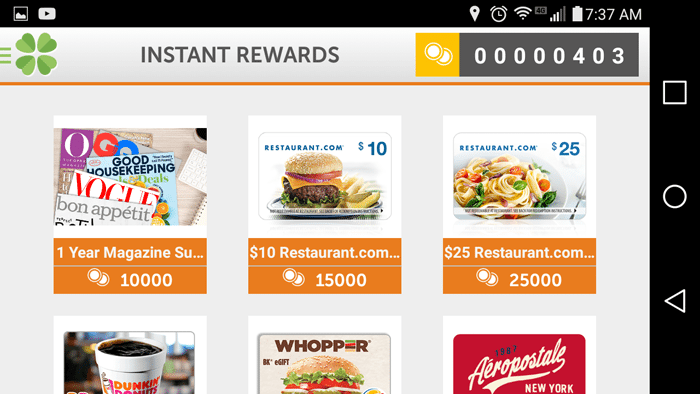 It seems that good app to earn some little cash rewards, especially in down time. I would like to have a try but too bad the app only applicable in the US and not my country yet. Hopefully, it will available in my country soon. But I do agree with what you mentioned and would like to earn serious money in online. After reading your last paragraph I was about excited how you earn full time with generating 10,000 per month. Thank you for sharing how you created additional income. I like the process you have shown on how the app works and what you have achieved with it. On the other hand it is a very busy site with a lot of click me plugins that redirect you to other offers. It was a little distracting and difficult to read the article about the App. This App is a very interesting one. Having over 10 million downloads means that it is offering something that people like. Can it actually generate income or does it take up most of your time watching ads? I’m not sure which is worth more, the dollar you get or, the time spent getting it. thanks for spending the time to test this out. I’d say that the amount of time you’d spend playing Lucktastic would be better spent doing something like working on you affiliate WA site, which has the ultimate potential of making you a lot more money. I think it looks like a total waste of time unless you’re a very bored person and can’t think of anything else to do. Nice review about Lucktastic. It sounds like doing surveys online for “money”, too much time to spend on it and not enough rewards. The only place you really find the time to do them is in the bathroom. You provoked my curiosity enough that I’ll still give it a try one of these days! I have never heard of Lucktastic before so I was very interested to read this. Hooked in the first paragraph and thought I will download once I have read this review but it is only open to US residents. I am in New Zealand so it is no good to me but still found myself reading the whole article to see how you got on. Sounds like a great app to pass the time but not to actually earn anything or win anything. Do you know if anyone has actually won anythign from this App? Firstly, I read every bit of your post. Secondly, I nearly downloaded the app, it does sound fun! However, after reading your conclusion and after seeing you do the math, it does appear to be somewhat of a waste of time, though, it is brilliant in a way because you can win some money. I believe if people spend more time actually learning to work online, instead of playing online, towards the goal of ten thousand per month there would be a lot less on unemployment in our world. This really was an excellent and impressive review! Thank you for a thoroughly informative and entertaining read with my coffee. Thank you for tour review of lucktastic. You saved me the time I would have wasted downloading it. There really isn’t much in the way of money for nothing so figuring out the hook these apps have is certainly an important step to take. The addictive gambling type of interface can draw many people and with many eyes on the app comes the opportunity to sell advertising. Looks like it might be fun, but at the expense of time. Yeah, sometimes it takes a while to figure out what the “hook” is. But that’s why I do these reviews…so people like yourself can pretty much skim them, figure out what’s going on, and then decide if it’s for you. Fun? Yeah. But for a long terms strategy for making money online or starting a business? Nope. Not really. Thank you for saving me from another shiny object. Have you ever experienced shiny-object-syndrome? I’ve been bouncing around looking for THE thing that will get me the freedom I so desire. I am out of the house 11 hours a day (sometimes more) and I need to be around more for my children. Your recommendation of Wealthy Affiliates, do you think it’s something a guy like me can do on the side about an hour a day? That’s about all I can muster at the end of my day after the kids are in bed. I have definitely been trapped in shiny-object mode, though less and less with “make money” stuff these days. Mostly to do with stock investing, and other ways of growing my money. As far as the business side of things, I’m pretty confident that I enjoy learning about affiliate marketing with Wealthy Affiliate, since it’s worked so well for me in these past years. Thank you for being so responsive to your comments. I have taken action on your suggestion and so far I am very impressed. What really sets it apart from the other shiny objects I’ve tried is the community on the inside. People helping people at its best. I read your about page and what a story. I hope to be able to generate similar successes in my life. Thanks again! Great review of Lucktastic app. I saw it couple of times in my google play but never paid attention of what this app was really about. 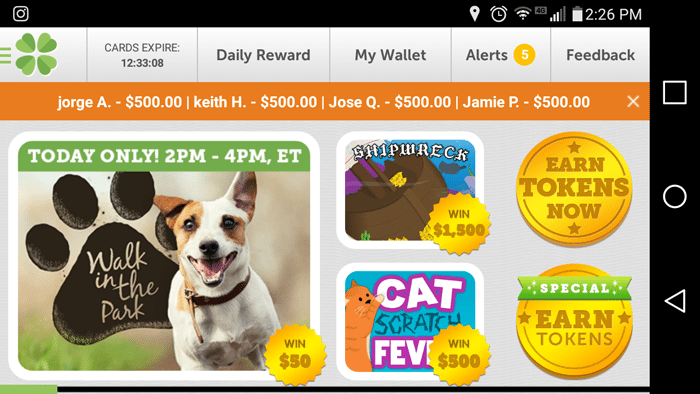 It is good to know that it is a scratcher gambling type of app where you can potentially win real $. Personally I do not like apps where I need to watch ads to proceed to the next step but it is understandable that creators need to earn money too. I will probably give this app a try as I have quite a bit of time and I like trying different apps. Thank you for the review. Yeah, gambling can be scary, even if it’s free. It’s kind of addicting, and can be a “gateway” into betting just a little money, then a little more, and so on. Of course, not everyone will fall into this trap, and many people will just spend their free time on Lucktastic, hoping to win a little bit of money. If you do end up giving this app a try, come back to let us know what your experience was like! The most important thing about an app is not what the company claims to do, but what the users say about it. I really enjoyed your site. I thought it offered a lot of viable options related to online businesses. I like how you offered a few ideas for niches online from gaming to essential oils. I think this website looks great. The only small thing I would probably add is find a way to communicate on your homepage exactly what your page is. I can see the cup of coffee with money, but without research I can’t exactly tell what you are here for. Other than that small thing it looks great. You also do a great job of separating text with photos and videos to keep the reader engaged. Keep it up!